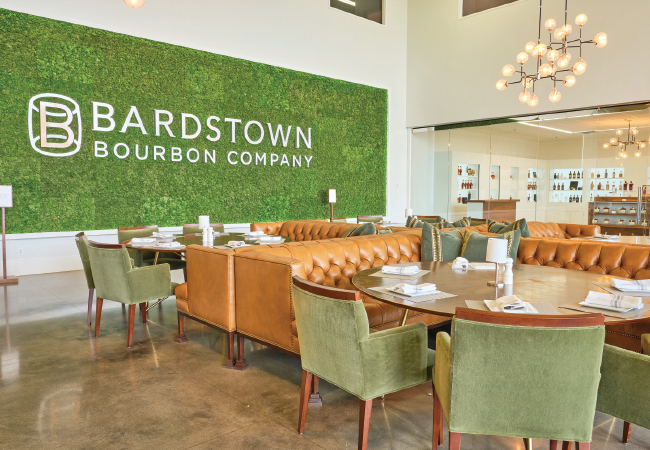 It’s worth the short road trip to Bardstown to sample the exotic offerings one of our area’s new distilleries over a delicious lunch or dinner. 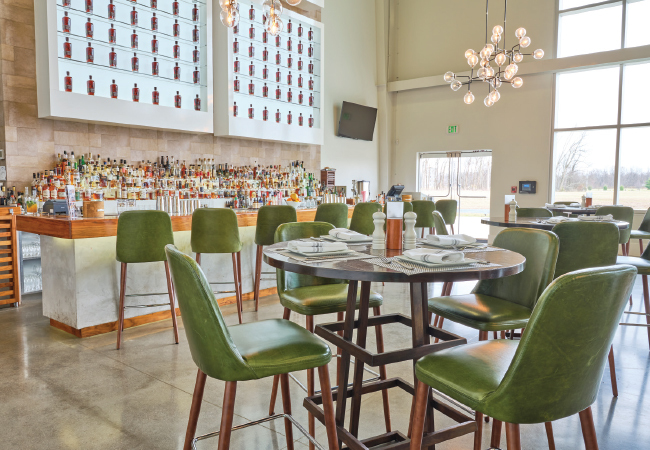 Nancy Miller shares the dish on Bottle & Bond. Felix Mosso’s culinary journey has taken him from growing up in California to working in restaurants in Italy and Puerto Rico. Along the way, the Culinary Institute of America asked him to open a culinary school in Sao Paolo, Brazil. After that he was named Chef de Cuisine at the famed Greenbrier Resort in West Virginia, and followed that role working for a whitewater rafting company, which called on top-notch cooking and organizational skills to prepare a thousand meals a day. 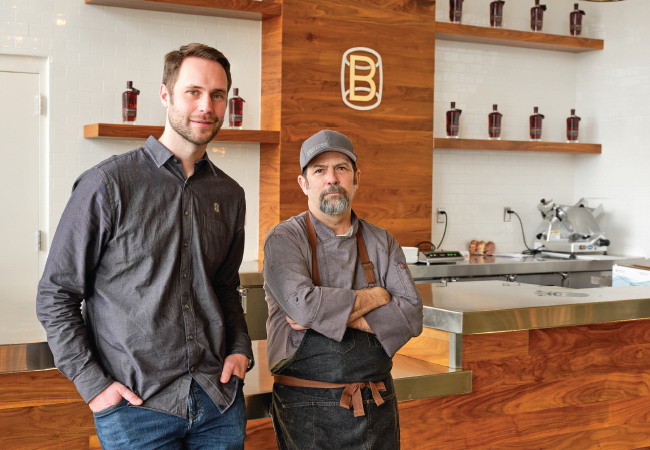 Finally, gourmands and bourbon lovers are welcoming him as Executive Chef at Bottle & Bond Kitchen and Bar at the Bardstown Bourbon Company. His Southern fare menu with a focus on Kentucky products is simple but refined. Among the fan favorites are baby back ribs, charcuterie, cast-iron fried chicken and glazed Brussels sprouts. 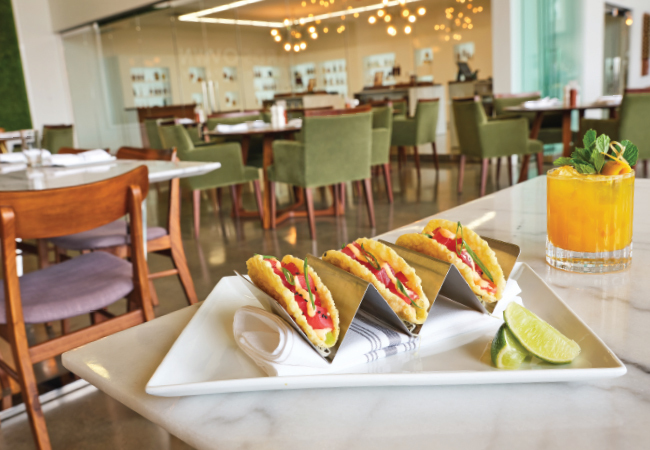 And he’s a chef who’s full of surprises, like the Sesame Tuna Tacos he shared with TOPS. Bottle & Bond has initiated an unusual staff program that features culinary students from around the world, including those from South Africa, India and the Philippines. Students who arrived last spring were essential to the restaurant’s opening. A new group will rotate in this spring when the first group returns to their home countries to work in food service. Getting the new staff ready for Derby is his next big challenge. It will be all hands on deck. He has never attended Derby and certainly won’t be able to leave the restaurant this year to make it to the big event. That’s ok with him. He says, “Horse racing is one thing, but people having a good time is what’s important to me.” He’s gearing up to make sure they have a spectacular time at Bottle & Bond. Central to Bottle & Bond’s identity is its synchronizing cocktail pairings with menu items. 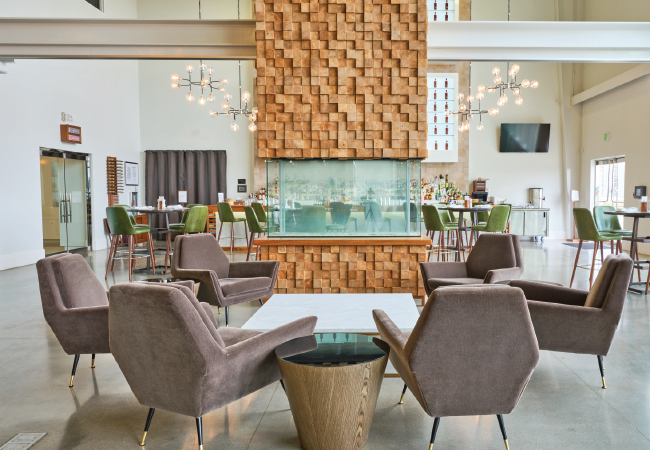 Mosso works closely with Dan Callaway, who formerly was the general manager at Decca, and is now Director of Bourbon Education, Visitors Experience and Product Development at the distillery. 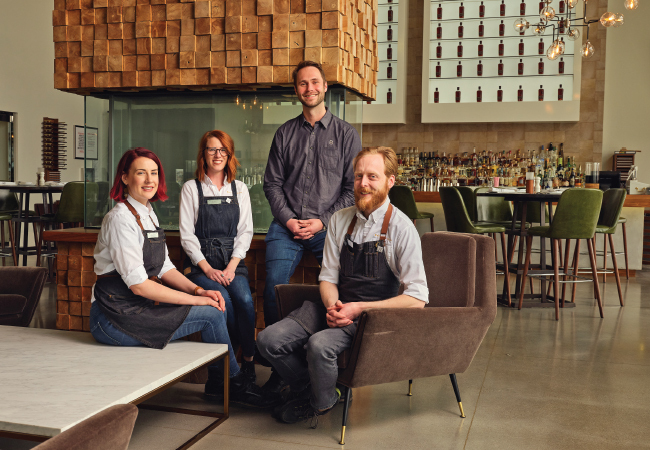 “Three full-time spirits specialists and I have certain flavors we know we want to highlight with bourbon, gin, tequila. It’s important that you’re able to taste every ingredient in our cocktails. Nothing goes into the drinks that doesn’t have a purpose. I think of it as a four-way seesaw, dialing in the ratios and finding harmony,” says Callaway. Cocktails are built around Bardstown Bourbon Company’s products as well as the distillery’s partner brands. Callaway and his crew came up with an imaginative twist on a barrel-aged Old Fashioned. A selection of bourbons was aged for a couple of months with eucalyptus, roses, orange peels and cane sugar, resulting in a light florality. That wasn’t the end of Callaway’s cocktail inventiveness. A special Manhattan blend was then poured into the Old Fashioned barrel for aging. He uses a medley of fresh vegetable and fruit juices in his drinks, and looks to syrups for an added level of taste and interest. The distillery won the 2018 Kentucky Bourbon Festival Challenge’s Best Mixed Drink competition with its Modern Prometheus, a heady combo of 10-year-old Calumet Farms bourbon, Cognac, cardamom and walnut oil, garnished with sliced apples and lemon peel. Into the cocktail was placed a large ice cube with apples in it. As the ice melted, the apple flavor became more prominent. 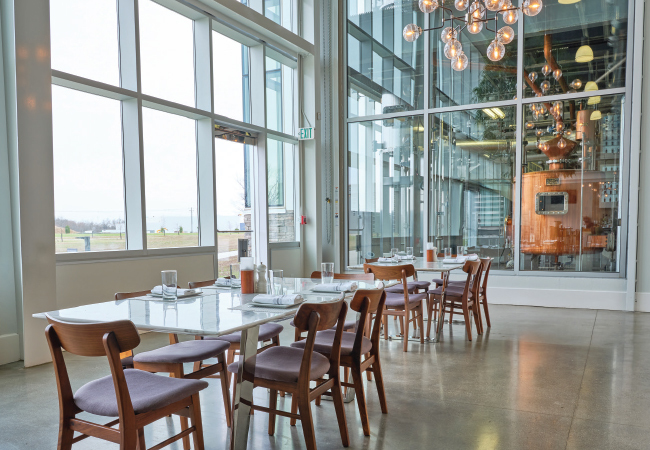 “The collaboration between the distiller, restaurant and bar has evolved organically,” says Callaway. “That’s the path we’re following as we move forward.” A delicious, spirited path, to be sure. Tell us about one of your fondest food memories. Two other people and I were on a motor boat on a lake in the Amazon. It was a very dark night, with only starlight. We ran out of gas and drifted toward a home. The homesteader met us at the end of a shotgun. We explained our situation and he invited us into his humble home where he and his family grilled a fabulous, large meaty fish for us. We spent the night in their home, sleeping on hammocks. The next morning, the larger boat we were supposed to have met the previous day found us. That was definitely one of my more remarkable memories. The chef world can be crazy, can’t it? Yes. Cooks and chefs are adrenaline junkies. When there isn’t an adrenaline spike, we tend to get bored. And there’s good stress and bad stress. It’s all about how you interpret and manage the stress. To treat the people who work for me with respect and that I need to understand each of their cultures. What’s your greatest food indulgence? A great smoked roasted rib or a roasted tambaqui, a fish I ate in the Amazon. Where in the world would you most like to have dinner, and with whom? I’d take my wife to dine in Sao Paolo, which is where we met. It’s a mecca of raw materials and a melting pot of food… Japanese, Chinese, Italian, Austrian, French, German and indigenous cuisines from each of the areas. I wish that everybody could be as happy as I am. Cut the wonton wrapper in a circle approximately 6 inches in diameter. Fry the wrapper in canola oil using a taco shell frying mold (available online and at some retailers) until very light golden brown. Allow to cool and drain. Pipe a bead of guacamole in the well of the shell. Squeeze a fine bead of sriracha mayonnaise on top of the guacamole. Layer the tuna over the guacamole and sriracha mayonnaise. Squeeze another fine bead of sriracha over the tuna. Garnish with shaved scallions. Squeeze lime juice over tacos as you are eating them. Clean the tuna while keeping it over ice. Dice into small, uniform cubes. Mix together all the ingredients. Mix the avocado vigorously with the remaining ingredients. Adjust seasoning to taste. Transfer to a disposable pastry bag. In a stainless-steel bowl, combine both ingredients. Adjust seasoning to taste. Shake all ingredients on ice. Strain into a rocks glass filled with ice. Garnish with a grapefruit peel and mint sprig. Heat the ingredients. Stir and cool after mixture is blended together.